like Peter and his brother Andrew, John and Paul, can be recognised by the particular iconographic features that characterised them already from the 3rd-4th centuries A.D. Peter is always portrayed with a beard and short white hair; Andrew is distinguished by a thick head of hair; John looks young and beardless. Iconography of the apostle Paul depicts him with the features of a philosopher: a face with hollow cheeks framed by a dark beard. He is always considered part of the group of twelve though he did not belong to the number of disciples that Jesus summoned unto himself. I hardly deserve the name apostle; but by God’s grace that is what I am, and the grace that he gave me has not been fruitless” ( 1 Co 15, 8-11). the 5th century, namely the Orthodox and Arian baptisteries, the twelve apostles – headed by Peter and Paul – are in a circle around the central clipeus of the dome, where the baptism of Jesus is depicted. In the Arian baptistery they move towards the Hetoimasia, the prepared throne on which the cross is enthroned; in the Neonian baptistery they solemnly make their way eastwards, towards the Christ, the sun of salvation. they form a crown around Christ, who is portrayed young and beardless, dressed in purple with the head adorned by a halo with a tri-radiant cross. In the arch that is closest to the apse there are Peter, Andrew, Philip, Paul, James and John; the arch at the entrance presents Thomas, Matthew, Bartholomew, James, Thaddeus, Simon the Zealot. The saints of the church, depicted in the remaining intradoses, are associated to them. In the basilica of St. Vitale the apostles are portrayed in the triumphal arch, with the image of Christ Pantocrator in the centre, holding the precious book of the gospel: he is the Word of the Father. Peter and Paul, placed in a prominent position compared to the other disciples, are portrayed beside the Lord. Associated with them are Saints Gervasius and Protasius who are acknowledged by the hagiographical tradition as the children of St. Vitale and St. Valerie. first recognise Peter and Andrew in the ‘Miracle of the multiplication of loaves and fishes’ (Mt 14, 13-21). The two brothers also appear in the ‘Calling of the first disciples’ (Lk 5, 1-11): Andrew is rowing intently, while Peter is holding the net filled with fish. The apse of the Basilica of St. Apollinare in Classe presents a symbolic illustration of the evangelical episode of the transfiguration (Mt 17, 1-9). as three lambs: Peter on the right of the cross, the brothers James and John on the left. The front surface of the arch of the apse presents the apostles symbolised as twelve sheep, six per side, stepping out of the heavenly Jerusalem. In the Galla Placidia Mausoleum they are depicted exalting the glorious cross that appears at the centre of the star-studded vault. Peter and Paul, placed in line with the axis of the Basilica of Santa Croce – the mausoleum was once connected to this building – are the guides of the group of apostles. Besides the basilicas, the apostles are portrayed on the sarcophagi both in the number of twelve, and in the scenes of the traditio legis and of the maiestas domini in which Peter and Paul are beside the Christ. The princes of the apostles are also portrayed in the Chest of Quirico and Giulitta, a magnificent reliquary of the 5th century A.D. that is treasured in the Archiepiscopal Museum of Ravenna. Finally, we must mention the Ivory Throne of Maximian, an extraordinary artistic work of the 6th century where we can notice the twelve in the images of the miracles of the Lord. 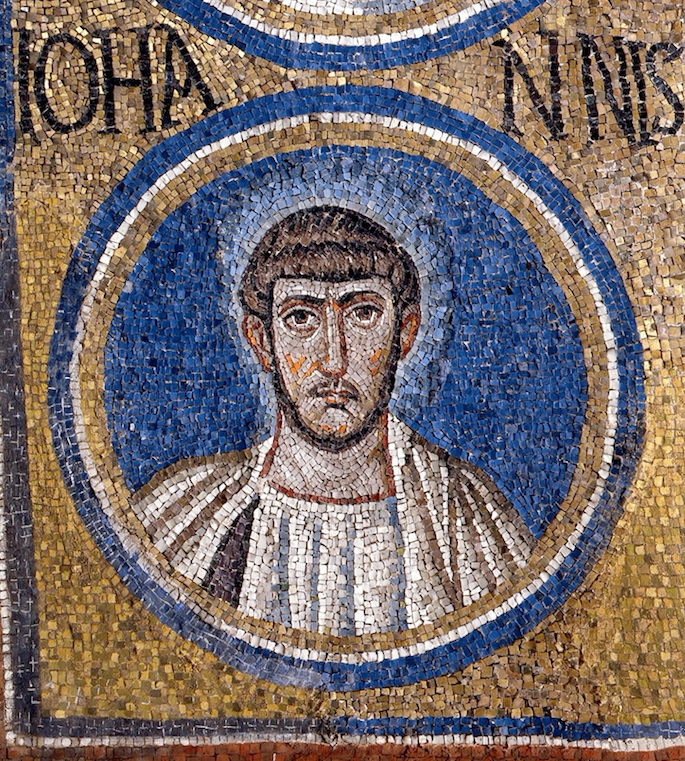 Matthew and John who, besides being the disciples of the Lord, are evangelists, must also be mentioned among the apostles: they are portrayed in human form or symbolised as an angel – Matthew – and an eagle – John – in all images containing the four gospels.